Researchers at the University of California, Berkeley, are proving that a camera phone can capture far more than photos of people or pets at play. They have now developed a cell phone microscope, or CellScope, that not only takes color images of malaria parasites, but of tuberculosis bacteria labeled with fluorescent markers. The prototype CellScope, described in the July 22 issue of the peer-reviewed, online journal PLoS ONE, moves a major step forward in taking clinical microscopy out of specialized laboratories and into field settings for disease screening and diagnoses. "The same regions of the world that lack access to adequate health facilities are, paradoxically, well-served by mobile phone networks," said Dan Fletcher, UC Berkeley associate professor of bioengineering and head of the research team developing the CellScope. "We can take advantage of these mobile networks to bring low-cost, easy-to-use lab equipment out to more remote settings." "The images can either be analyzed on site or wirelessly transmitted to clinical centers for remote diagnosis," said David Breslauer, co-lead author of the study and a graduate student in the UC San Francisco/UC Berkeley Bioengineering Graduate Group. "The system could be used to help provide early warning of outbreaks by shortening the time needed to screen, diagnose and treat infectious diseases." The engineers had previously shown that a portable microscope mounted on a mobile phone could be used for bright field microscopy, which uses simple white light -- such as from a bulb or sunlight -- to illuminate samples. The latest development adds to the repertoire fluorescent microscopy, in which a special dye emits a specific fluorescent wavelength to tag a target -- such as a parasite, bacteria, or cell -- in the sample. "Fluorescence microscopy requires more equipment -- such as filters and special lighting -- than a standard light microscope, which makes them more expensive," said Fletcher. "In this paper, we've shown that the whole fluorescence system can be constructed on a cell phone using the existing camera and relatively inexpensive components." "LEDs are dramatically more powerful now than they were just a few years ago, and they are only getting better and cheaper," said Fletcher. "We had to disabuse ourselves of the notion that we needed to spend many thousands on a mercury arc lamp and high-sensitivity camera to get a meaningful image. We found that a high-powered LED -- which retails for just a few dollars -- coupled with a typical camera phone could produce a clinical quality image sufficient for our goal of detecting in a field setting some of the most common diseases in the developing world." "Viewing fluorescent images is a bit like looking at stars at night," said Breslauer. "The bright green fluorescent light stands out clearly from the dark background. It's this contrast in fluorescent imaging that allowed us to use standard computer algorithms to analyze the sample containing TB bacteria." Breslauer added that these software programs can be easily installed onto a typical cell phone, turning the mobile phone into a self-contained field lab and a "good platform for epidemiological monitoring." While the CellScope is particularly valuable in resource-poor countries, Fletcher noted that it may have a place in this country's health care system, famously plagued with cost overruns. "A CellScope device with fluorescence could potentially be used by patients undergoing chemotherapy who need to get regular blood counts," said Fletcher. "The patient could transmit from home the image or analyzed data to a health care professional, reducing the number of clinic visits necessary." The CellScope developers have even been approached by experts in agriculture interested in using it to help diagnose diseases in crops. Instead of sending in a leaf sample to a lab for diagnosis, farmers could upload an image of the diseased leaf for analysis. Schematic of the CellScope set up for fluorescent imaging. For bright field imaging, the two filters and LED are removed.Schematic of the CellScope set up for fluorescent imaging. For bright field imaging, the two filters and LED are removed. 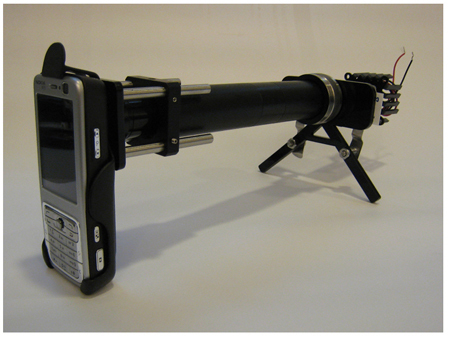 The researchers are currently developing more robust prototypes of the CellScope in preparation for further field testing. Other researchers on the team include Robi Maamari, a UC Berkeley research associate in bioengineering and co-lead author of the study; Neil Switz, a graduate student in UC Berkeley's Biophysics Graduate Group; and Wilbur Lam, a UC Berkeley post-doctoral fellow in bioengineering and a UCSF pediatric hematologist. Funding for the CellScope project comes from the Center for Information Technology Research in the Interest of Society (CITRIS) and the Blum Center for Developing Economies, both at UC Berkeley, and from Microsoft Research, Intel and the Vodafone Americas Foundation. The study can be found online on the PLoS ONEwebsite.